History of the creation of one of the best fighters of the Great Patriotic La-5 dramatic and paradoxical. In 1940, the Red Army was adopted designed Lavochkin, V.P.Gorbunovym M.I.Gudkovym and LaGG-3. Unfortunately, he had a serious flaw - obviously lacked power, and the aircraft was removed from production. Only one replacement of the engine saved the situation - with him in the car showed outstanding test data and was launched in a series under the designation La-5. Excellent flight performance and powerful weapons fighter pilots helped our confidence to beat the enemy. 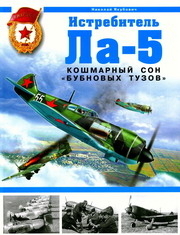 It is on the La-5 fighting opened the scoring victories Ivan Kozhedub, the future three-time Hero of the Soviet Union. On "Lavochkin" fight each Soviet ace - Kirill Evstigneev, shot down 56 enemy aircraft and end the war twice Hero of the Soviet Union. On the La-5 had his last fight, Alexander Horowitz - being one on one with a large group of German bombers, he shot down nine dive bombers Ju-87. Original title: La-5 fighters. Nightmare "Jack aces"